You’re never going to believe this. I hardly believe it, and it happened to us! In a recent post about bee boxes, I mentioned that we planned to capture wild swarms to start our hives. We’ve since finished the boxes. Unfortunately, the weather this year has put a pretty serious damper on our chances of finding a swarm. It’s been cold and rainy, and bees eat more when it’s cold and can’t fly when it’s rainy. That’s a recipe for killing a lot of wild hives. (On a side note, the ones that survive should have really strong genetics.) We were also counting on catching at least one swarm from Robin’s uncle. He has two hives that live in the exterior walls of his house (he’s something of an eccentric fellow), and they throw several swarms each year. Sadly, one of those hives has now died as well (starved). So, given this backdrop of bee-gloom, I stepped out onto the back porch of our house during my lunch break yesterday and heard a loud buzzing sound. About 50 feet away, a huge column of bees was swirling near an oak tree in our backyard. A honey bee swarm! In our backyard!! So anyway, back to the problem at hand. Honey bee swarm! No place to put the hive. Ahhhhh. We hadn’t selected an apiary (beehive yard) site yet, so I dragged Robin outside and we talked out a location. We picked a spot in the field by the garden. 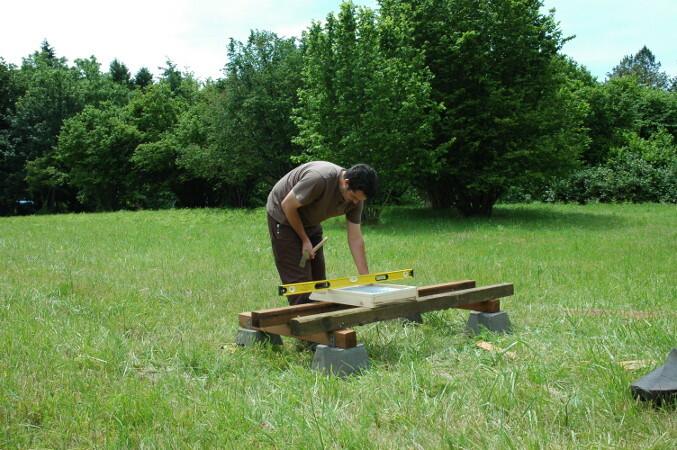 I then started running around like a crazy person, trying to quickly build a hive stand using some concrete pier blocks and scrap treated 4×4 we had on hand, and leveling the stand with cedar shims and tacking it together with a few sinker nails. We carried the hive base, box, frames, and feeder outside and set them up with an impromptu lid. We were all ready to capture the swarm, but at this point a little thing called “my day job” got in the way. My lunch hour was over, and I had already taken too many days off because of the flu to take off another afternoon for bees. So, I checked on the bees one more time (still quietly massing on the tree limb) and went inside. A few hours to a few days right? We have lots of time. Wrong. An hour later Robin went outside to check on the swarm, and they were again buzzing and flying about wildly. Suddenly, the whole swarm lifted up off the limb and began moving as a cloud about 8 feet off the ground. She chased it across our field into the hazelnut thicket, whereupon she lost track of it. Darn bees! Where’s the indecisive bees when you need them? Two hours? Really? Did you have to make a decision so quickly? Going for some kind of record are we? Never read the book? Could you guys not have at least waited until evening, so I could put you in a box? It would have been a great home, I promise!! So, that’s the story. A honey bee swarm literally landed in our backyard, but flew off before we could capture them. Robin and I retraced their path later in the evening, and assuming they flew in a straight line we think it’s unlikely they stayed on our property or the next. More likely they crossed the road, as the neighbors across the way have old orchards and some dead fir trees that probably have lots of large cavities for nesting sites. Here’s hoping they picked a good home. The only thing worse than them flying off is if they were promptly killed by some idiot with a can of bug spray. This entry was posted in Beekeeping, Nature. Bookmark the permalink. Argh!!! So exciting and so frustrating! You’ve got me quite curious as to where all the bees around here come from. One of these day, I need to find out. And maybe get into beekeeping! Esp. if one can do it without dropping big bucks on the venture. What a close call! But if there is one swarm, there should be more – just keep your eyes peeled. Now that you have your hive built and in place, maybe the next batch can be boxed as soon as you see them. Oh, such excitement!!! The bees came to you! Can you ask your neighbors if you can go look around their properties for bees? Once the bees select a home, can you move them? Obviously the bees don’t belong to anyone, you neighbors probably wouldn’t care, would they??? I don’t think we have many honeybees around our neighborhood. I always look for them on flowers and clovers in the yard. I see alot of bumblebees and wasps, but not honeybees. I think we need to get us some honeybees, too! Especially if, like Ron said, it wont cost us big bucks! Good luck finding your swarm! What a heartbreak! But it makes for an exciting blog post. 😛 I think I’ve only seen one swarm in my life, but hopefully you’ll have another coming your way soon. Don’t despair, Forsty said he thinks his remaining hive is about ready to split again. Maybe you’ll catch that one. Ron – Yeah, that swarm in the tree really made me feel like I had the beekeeping bug, so to speak. 🙂 Costs vary pretty widely depending on what you decide to do. The cheapest way to get started is to buy a suit ($60), smoker ($20), and hive tool ($5). 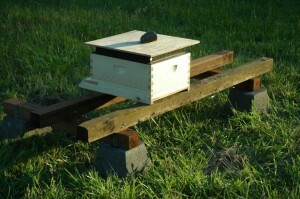 You can then build a kenyan top bar hive using free plans and scrap wood, and capture a wild swarm. I considered this, but the regular maintenance required by top bar hives to prevent swarming kind of scared me off. I decided to go with standard Langstroth equipment, mostly following the low-impact beekeeping advice here. For that you need a base ($20), at least three medium boxes ($30 total) and thirty frames ($45). I’m building my own lid. I might build my base and boxes in the future too, but the frames probably aren’t worth the trouble. I also bought one hive-top feeder that I’ll move around if a hive needs it ($15). So, I guess I’m out about $200 right now, and setting up for an additional hive would cost $75. It gets much more expensive the more you head toward “modern” beekeeping. For my one hive, this would include adding wax or plastic comb foundation ($45), purchasing bees to put in the hive ($90), and a variety of medications, applicators, supplements, feeders, boxes of different size, etc. I know you can save a lot of money by catching a deal on used equipment. The only concern if you go this route is to make sure there weren’t any problems with diseases. Foulbrood can stay in the hive bodies and frames and infect the next colony. The only solution is to burn it. Benita – I know, it was super disappointing. I’m actually not sure I would have noticed the swarm if I hadn’t come out just as they were landing. 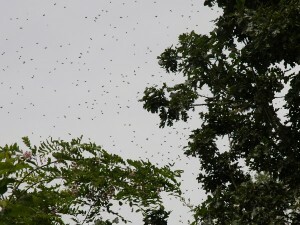 Within 20 minutes they were just a quiet mass of bees hanging up in the tree. 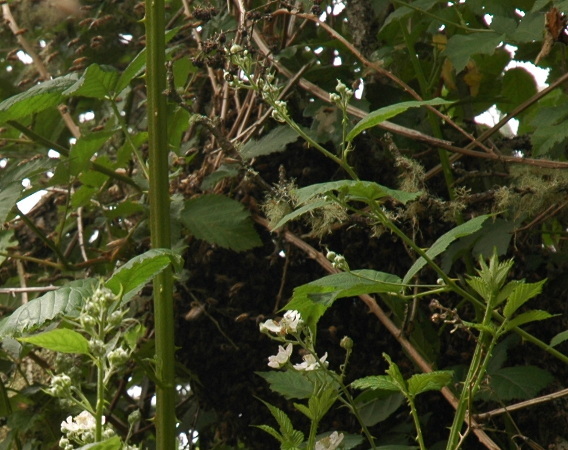 Lynn – Left to their own devices, bees will usually pick hive locations that are up off the ground pretty far. If they are in a tree, then there’s no easy way to capture the hive. If they moved into the wall of a house then you have to tear the siding off and cut out the comb, all while being mobbed by some really angry bees. All of the above is beyond my present experience level (nil), so I’m saying a swarm lost is a swarm lost. Yes, costs in this enterprise were important to us as well. I spent a lot of time considering my options on that front, and I have plans to further simplify our future hives. Leigh – That was my first swarm too. Very exciting! I suppose it gets pretty ho-hum after you raise bees for a while. Then your own hives are throwing out swarms too, so it’s a regular event in spring. Lol – a drive home with a swarm of bees in the car! Now that really sounds funny! I think I would be the one with the can of bee spray!!! Wow, at least you got to see the bees swarming. I’ve only seen in on a Nova documentary about bees. It was really cool. Just think of this one as a practice session. Next time, you’ll really be ready! JohnG – Hey John, it’s a little different with the Africanized bees of Arizona. They aren’t nearly as friendly. I know you can keep them for honey too, but it sounds painful. My one experience with a swarm of them in AZ was to run quickly in the other direction as well. Africanized bees can’t really come this far north. They don’t plan well for the winter–swarming just before it gets cold, maintaining too large a colony and too few stores–thus they starve themselves out over Northern winters. Incidentally, the Western Yellow Jacket is considered just as fierce as Africanized bees, but it doesn’t seem to make the news nearly as much. Charity – Booo! Well, I can understand why people do that, but when possible the better solution is to call your local beekeeping association or the county extension service. You can get swarms removed for free this way, and it both saves a colony and makes somebody happy. Rachael – Yes, it was very strange. Like something out of National Geographic. Perhaps the thrill wears off after you’ve done it a few times, but I was excited.